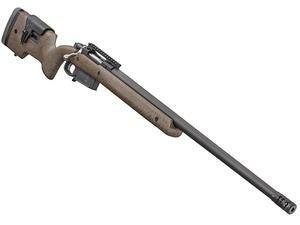 Ruger M77 Hawkeye Long Range Target 6.5 PRC 26"
Rifles > Ruger M77 Hawkeye Long Range Target 6.5 PRC 26"
Ruger® designed the M77® Hawkeye® Bolt-Action Rifle with 2 principles in mind: simplicity and strength. At the core of the M77 Hawkeye is an ultra-reliable action based on the Mauser 98—considered one of the strongest and most dependable firearm designs for over 100 years. Hornady's short action 6.5 PRC(Precision Rifle Cartridge)offers a 250 fps more velocity compared to 6.5 Creedmoor. This cartridge offers great balance between performance, trajectory and recoil, without excessive barrel wear. Free-floated, cold hammer-forged 4140 chrome-moly steel barrel with 5R Rifling at minimum bore and groove dimensions, minimum headspace and centralized chamber. 20 MOA Picatinny rail secured with four, #8-40 screws for increased long-range elevation capabilities overtop the traditional patented integral scope mounts that are machined directly on the solid-steel receiver. Two-tone Target stock features two-way adjustable comb, adjustable pull length with soft rubber buttpad, QD attach points and flush mounted Lower M-LOK® rail. Ships with one AI-Style magazine. Overall Length 47 - 48.50"
Length of Pull 13 - 14.5"